I was going to keep with the whole seasonal theme of fall foods, but am sitting here thoroughly enjoying my lunch of leftovers...and decided I would post this recipe today instead. I am a huge fan of www.skinnytaste.com and have been cooking up many of her posted recipes for the past few months. She always includes nutritional info AND points! So it makes it easy to choose things that fit into my plan. I have never had a miss with any of her recipes...and I just love her pictures. In fact, they are what inspired me to start a food blog of my own. I spotted this recipe for black eyed peas a few weeks ago, and knew it was one I wanted to try. 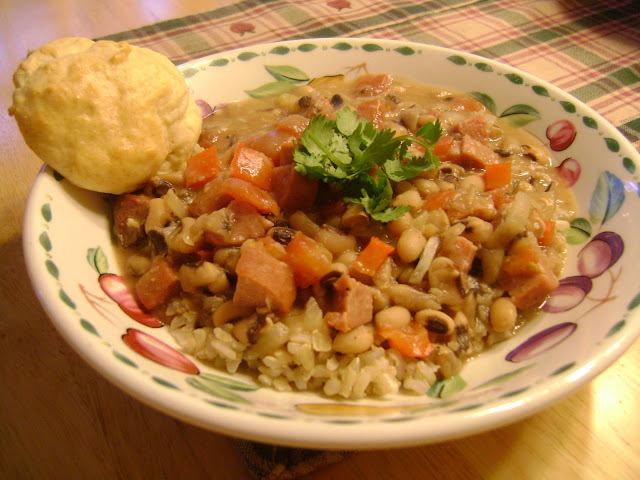 Very reminiscent of New Orleans style red beans and rice. 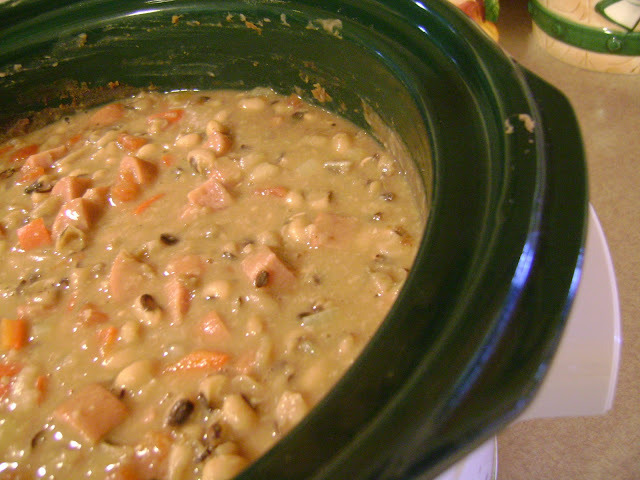 The original recipe called for cooking the black eyed peas in the crockpot. I have never used a crockpot to cook beans before, so I was anxious to give it a try and I have never had, let alone made, black eyed peas. I was not disappointed! A definite home run hit! Almost done. After removing the bay leaf and ham hocks and adding the spices and other ingredients. Soak the beans in about 6 cups of water overnight. The next morning, drain the beans and put into a crockpot with 4 cups of fresh water, the ham hocks and the bay leaves. Cook on high for about 4 hours or until beans are tender. Remove ham hocks and bay leaves and discard. In a large nonstick frying pan coated with cooking spray, saute the onion, red pepper, and garlic until soft. ( approximately 5 minutes ) Add the sauteed vegetables to the crockpot. Add the rest of the ingredients to the crockpot and stir. Cover crockpot and let it come to a boil, reduce the heat to low. Simmer for another 30 to 45 min to combine flavors.